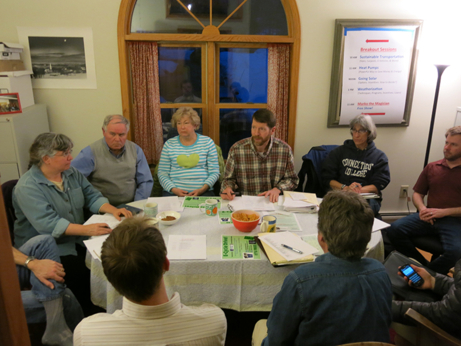 Waterbury LEAP (Local Energy Action Partnership) was created in 2007 and is one of the most active town energy committees in Vermont. LEAP’s mission is to engage the community in reducing carbon emissions and promoting energy efficiency and the use of renewable resources. support reductions in man-made emissions that contribute to global climate change; assist individuals and organizations to make positive changes towards reducing fuel bills and to produce more energy locally; strive to be a model for what small towns in the U.S. and elsewhere can do to address the global climate crisis. Waterbury LEAP is an independent organization. In this respect, it can be more flexible and responsive when opportunities arise, help the town when it can, and pursue those priorities and projects that are important to it without the oversight of the municipal government or the voters. LEAP recognizes that town officials have a lot on their plates, and something that is a high priority to LEAP might not be a high priority to local government. LEAP has a very strong relationship with town officials. It communicates regularly with the Selectboard, Planning Commission, Conservation Commission, and the School Board. It also works with other Waterbury non-profits. LEAP also initiates and carries out projects on its own, or in partnership with other organizations such as the Vermont Energy & Climate Action Network (VECAN) and Efficiency Vermont. Organize an event to identify interested folks and help kick things off. In March 2007, interested citizens organized a local ‘Step It Up’ event 125 people attended, 60 people signed up saying they wanted to help Waterbury become more energy efficient, and LEAP was born. Build a strong email distribution list. Email is the best way to connect with a large group of folks Gather emails all the time from ‘like- minded’ folks Write your emails carefully and make them brief, relevant, and periodic. It’s critical to decide on a clear mission and structure. What are you trying to accomplish, and who is responsible? It helps to have core group of folks (5+) who can be counted on to show up and help. Attend as many town events as possible and be visible. LEAP has had displays at town fairs, farmers markets, Home & Garden shows, July 4.th parades, and other activities. Pick a few projects that are tangible, useful and measurable. Complete the projects, and report success widely. You may find that more people want to join your effort. Run efficient meetings. The quickest way to sap an organization’s energy and enthusiasm is to hold long meetings where no decisions are made. Each meeting should have an agenda. The chair should keep discussion on topic and on time. Start and finish the meeting on time, and clarify ‘to do’s’ at the end. Everybody can benefit from the work of an energy committee. Inform individuals, businesses, schools, social organizations and the municipality about your work and its benefits. The more constituencies involved in your work, the more support you’ll receive. Don’t be afraid to ask for ideas and support. Waterbury LEAP has never had anyone in the environmental and energy community turn down a request for suggestions or support. Involve town leaders. Always invite town leaders (Selectboard, planning commission, town manager) to your events, and give them updates on your progress. Pace yourself, and take the long view. Don’t take on more than you and your fellow volunteers can accomplish. Plan reasonable, achievable goals for the next couple of years. Build on your successes, and celebrate your achievements.